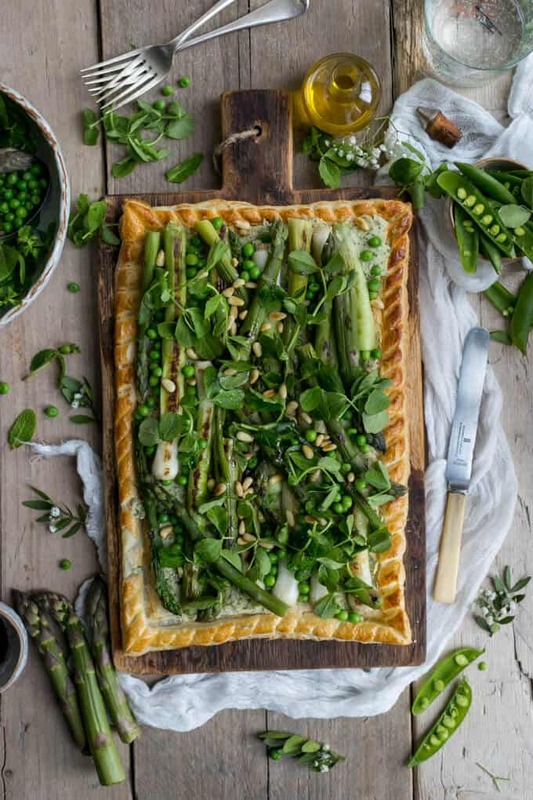 This Charred Asparagus Tart with butter bean paste and baby leeks is just packed with fresh, seasonal produce and bursting with Spring flavours! And in case if you didn’t know, it’s the Eurovision weekend! I’m not the one to celebrate it, but I know many who will. There will be many parties happening, and where’s the party, there’s always food! And I’m always up for that! 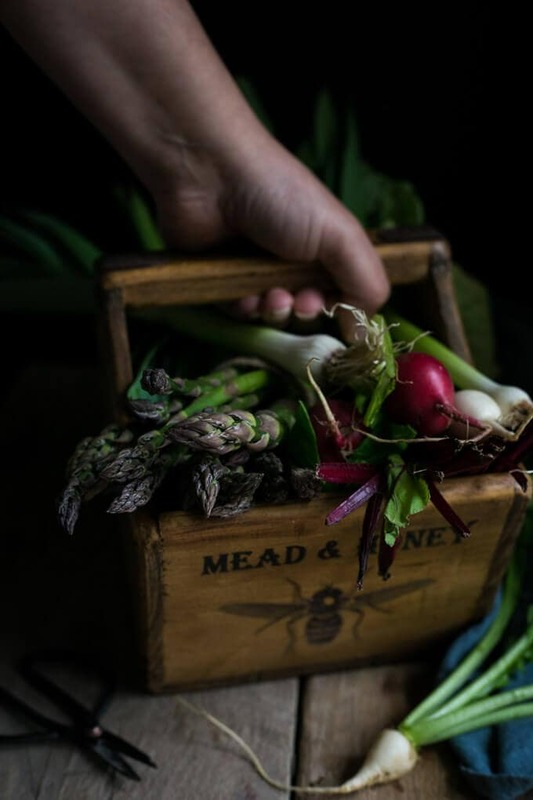 With all the seasonal, fresh produce that Spring has on offer, I feel like we are spoiled for choice at the moment! 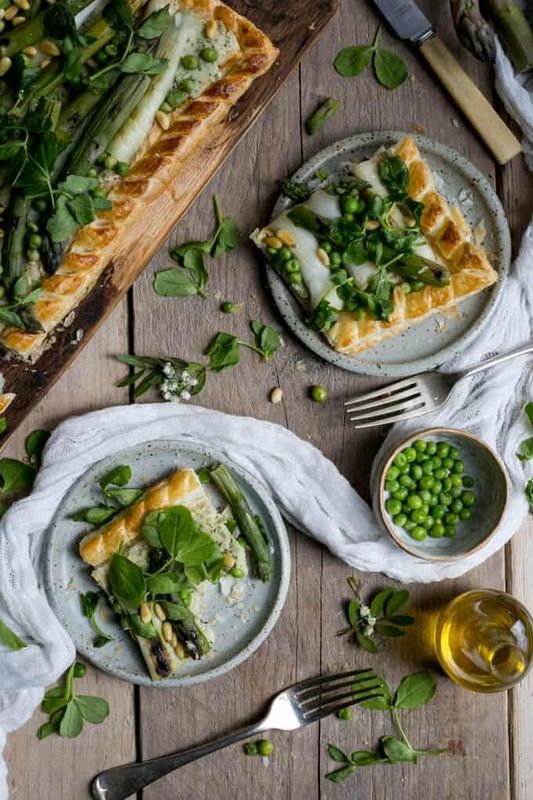 So today’s recipe incorporates quite a few of this season’s veggies and herbs, and it’s bursting with Spring flavours! 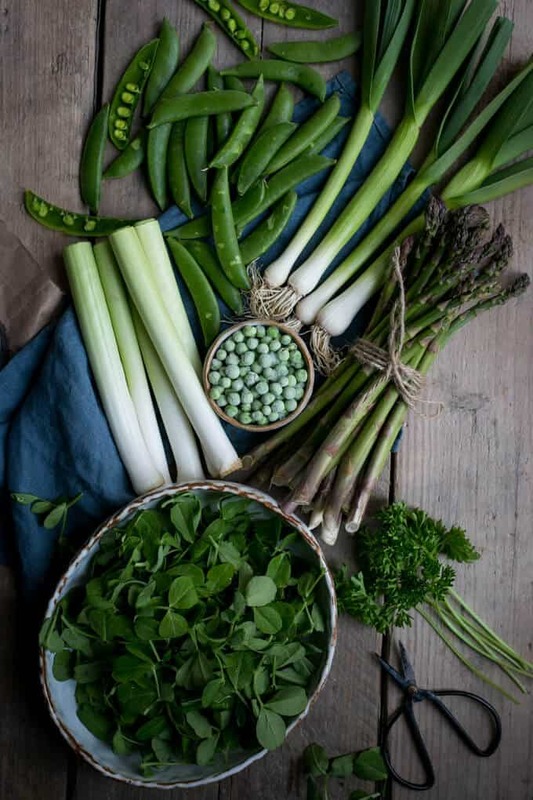 We have asparagus, baby leeks, peas, pea shoots, pine nuts, fresh herbs and butter beans. Yup, all in one go! When starting this blog last year, I was so eager to make at least 3 new recipes every week, and even more eager to post them on this website at least every other day. And I did. To start off with…But after a few weeks/ months of doing so, I hit the wall. And I hit it so badly, that it resulted in me almost giving it all up. I was exhausted and drained. No matter how hard I’ve tried, every recipe I came up with was just terrible. I also quickly discovered that smoothie bowls and chia puddings are not what I want to do long term (I have nothing against either, I just got very bored of them very quickly). And I think I’m not the only one, who had these feelings. I know there are some of you out there, struggling to find new ideas, fresh content and some inspiration… So I just wanted to share with you a couple of tips, on what you can do, to bring your culinary mojo back! Also, just to re-assure you, there is no shame in re-creating the recipes of others, or being influenced and inspired by the recipes of others! At the end of the day, these recipes are there to be created, tested and experimented with!!! Other blogs! That’s the really obvious one, but had to be included here. There are trillions of food blogs out there with absolutely stunning photography and recipes, waiting for you to visit them. I’m planning on making a separate post about super inspiring (at least in my opinion) blogs, and they are not all necessary food related, but for sure will get your creative juices flowing! TV Food Channels- another really obvious one. Whenever I’m watching my favourite food program, I always have a pen and paper ready, in case if there is a good recipe worth testing! Podcasts are a great source of information and inspiration, so go and explore!!! You will be shocked how much you have missed! So there you have it dear friend. And I’m aware I have not discovered anything new in these tips above. But if it helps even one person out there, who is stuck for any new recipes/ ideas, I’m happy! Just remember to give the necessary credits where needed. If you have been inspired by particular recipe or a blogger, mention it in your post, link to the relevant website or social media channel. Such a long intro to get to the recipe! But we got there. 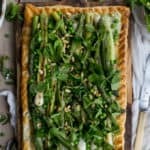 All what’s left is to say that this charred asparagus tart with baby leeks and butter bean paste will be probably your favourite tart of the season. It’s really easy to make, despite long description and instructions. Ingredients can also be easily customized and you can use your favourite veg and herbs. I hope you will enjoy it, and as always, have a great weekend! 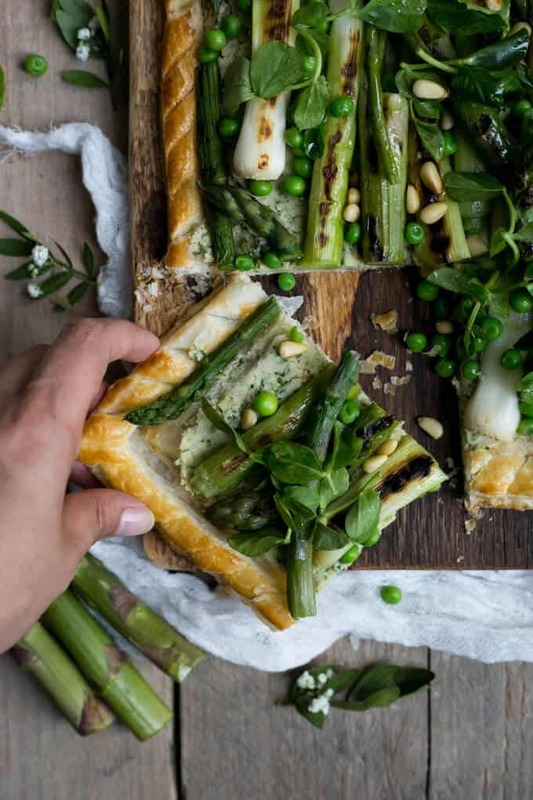 Super easy recipe for charred asparagus, baby leeks and butter bean tart made with puff pastry. 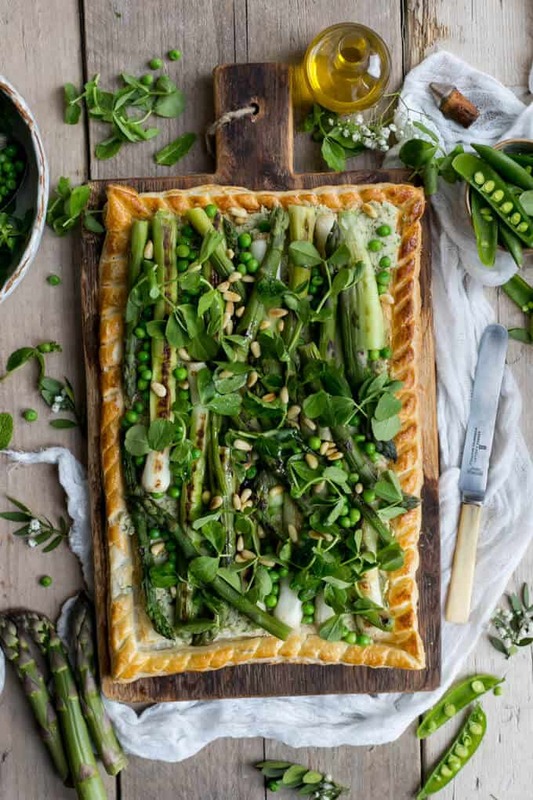 Packed with all delicious Spring greens! Heat the oven to 200 C. Unroll the puff pastry into a baking sheet and using small, sharp knife, score a rectangle onto the pastry, leaving about 2 cm boarder (you can score the boarder to make a pattern). Brush the boarder with some nut milk (or beaten egg yolk if not vegan) and bake for about 20 minutes until golden brown. Set aside. In a medium pan, boil some water and cook asparagus and baby leeks for a couple of minutes. Take them out and cool under cold, running water. Set aside on a paper towel. Add the peas to the boiling water and cook for couple of minutes, remove from the water and cool down under running tap. Set aside on a paper towel. Heat some oil in a saucepan and cook the onion over a medium heat for 5 minutes, then add the garlic and cook for another 2-3 minutes, remove from the heat. Put the onion and garlic in the food processor, add beans, sumac, lemon juice and zest, tahini, half the herbs and oil. Add pinch of salt and pepper and whizz to a puree. Heat a griddle pan until smoking hot, add a little oil, asparagus and leeks. Char for 5- 8 minutes until the veg are cooked through and have sear marks all over. To assemble the tart, push the middle of the rectangle of the pastry down, leaving the raised boarder. Spoon the butter bean puree to the centre and smooth it all over the base. Top with charred asparagus and baby leeks, peas and pea shoots, some toasted pine nuts and mozzarella (if using). Garnish with a pinch of sumac and remaining herbs. Awww Stacey!!! I adore your gorgeous bowls and everything else you create! But totally understand you, and it’s hard to ‘go with the unknown ‘ especially if your audience is used to a specific thing/ style/ recipe, but I know that whatever you will make, you will smash it girl! And thanks so much for visiting! Have a great weekend! Thanks so much for coming over!!! And I’m so happy you found it useful! And I agree, posting good content and the whole process leading to it takes time, and it’s hard, especially if you have a day job. I’m sticking with my once a week for now, but hope your plans will work out lovely lady!!! That a beautiful dish full or springy goodness. Thanks so much for visiting and for your lovely comment! A spectacular recipe, Anna! Loved the pictures you provided, simply stunning! And how lovely of you to come around and leave such an encouraging comment! Anna, wow, what a recipe! This tart looks absolutely stunning! And I love all the recipes here on your page, I couldn’t care less where they are coming from, I love seeing your take on them and look at your beautiful photos (which are getting better and better with every single post!). I love all your recipes, you are amazing!!!!! Thanks so much for your comment and for stopping by! Have a great weekend, and thanks for being so awesome! Anna, this is so beautiful and full of my 5 a day good greens. This is delicious. You have such great ideas and recipes, I love them. Thanks sooooo much! You are right, it’s packed with all the healthy veggies! Asparagus season is one of my favourite times of the year!